The “King’s Band” (later known as the Royal Hawaiian Band) had its beginning in 1836; it continues today. Founded by King Kamehameha III, it became a part of daily life by performing for the public, state occasions, funerals and marching in parades. The band accompanied reigning monarchs of the time on frequent trips to the neighbor islands and brought their music to remote destinations of the kingdom, such as the Hansen’s Disease settlement at Kalaupapa on the island of Molokai. In the 1880s, the Royal Hawaiian Band played concerts twice a week in Queen Emma Square. 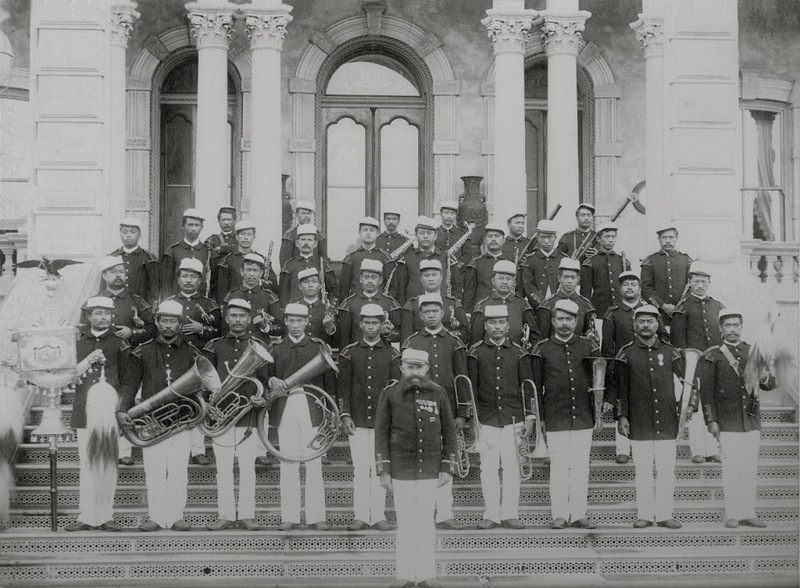 After the 1893 overthrow of Queen Lili’uokalani, the Provisional Government under Sanford B Dole demanded a loyalty oath of all employees, including the musicians of the Royal Hawaiian Band. Click HERE for a rendition of Kaulana Nā Pua by Cyrus Green. Today, the Royal Hawaiian Band is an agency of the City and County of Honolulu and is the only full-time municipal band in the United States. The band performs and marches in over 300 concerts and parades each year including: city, state, and military functions; schools, community centers, shopping malls, retirement communities, graduations, and private events. Weekly public performances are held on Fridays at ʻIolani Palace and Sundays at the Kapiʻolani Park Bandstand. The image shows Henri Berger standing in front of the Royal Hawaiian Band – 1889. I have added other images to a folder of like name in the Photos section on my Facebook and Google+ pages.